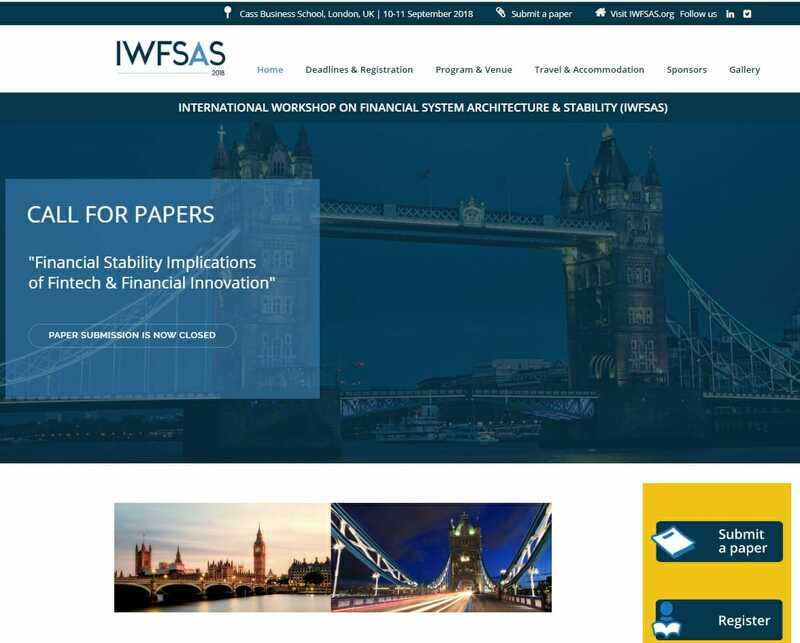 The Euro-Mediterranean Economists Association (EMEA) is the main sponsor of the International Workshop on Financial System Architecture and Stability 2018, (IWFSAS 2018) which will take place in London, on the 10th and 11th September 2018. EMEA will also sponsor a Best Paper Award which will be presented during IWFSAS 2018. The International Workshop on Financial System Architecture and Stability (IWFSAS) aims at providing a forum for academic researchers and policy makers to discuss issues related to the structure and design of financial systems and their impact on growth and financial stability.While the specific theme of the workshop may vary from year to year, the overall objective of this annual event is to facilitate discussions of high quality policy relevant research papers that inform our understanding of how various financial sector policies can affect the architecture and stability of the financial system and the overall economy, nationally, regionally and globally. IWFSAS 2018 will be hosted by the Centre for Banking Research at Cass Business School, in collaboration with the Gustavson School of Business and the Department of Economics at the University of Victoria. In this third annual meeting of IWFSAS, the feature topic is financial innovation, including financial technology (“Fintech”). Besides dominating the recent financial news, Fintech has also attracted a lot of interest from policymakers and academic researchers. Keynote speaker of the Workshop is Franklin Allen, Professor of Finance and Economics and Executive Director of the Brevan Howard Centre at Imperial College London. On Tuesday, 11 of September 2018, from 3:30 to 5pm, a public panel discussion on “Financial stability implications of fintech and financial innovations and regulatory challenges in diverse financial systems” will be moderated by Rym Ayadi, IWFSAS Co-Chair, Honorary Professor at CASS Business School, Member of the Centre for Banking Research (CBR) at the City University in London and Founding President of the Euro-Mediterranean Economists Association (EMEA). The public panel is free and open to the public (the rest of the conference is by registration). The Centre for Banking Research (CBR) at Cass Business School promotes high caliber academic research in the field of banking and fosters the teaching of banking subjects to a high standard. Drawing on the wide experience of its core and associate members, the Centre offers expert analysis of the economic and business environment that affects the banking and financial sector. As such, CBR is able to provide specialist consultancy to the banking and financial services industry, public sector organisations, regulatory authorities and governments.